This is a set of criminal records vacating forms, with instructions, approved by the King County Prosecutor’s Office, to expunge / get a criminal record cleared or sealed (if you have satisfied the time requirement after the crime, and other state law-required satisfaction/restitution). SAVE! – No shipping or handling fees when you buy this kit as an instant download. Once you complete the ordering process, you will receive an email with instructions on how to download the form. (Check your Junk/SPAM email folder if you do not receive the email within a few minutes of ordering). 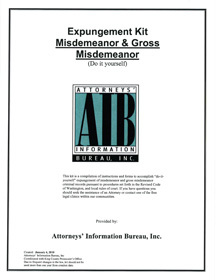 questions regarding the forms/kits, you should contact the attorney of your choice. Three Ways to Order a Kit! 1 – ONLINE – Click on Kits/Forms. 3 – VISIT our office located in the King County Courthouse and purchase a copy. Click Contact Us for our address. @ 2014-2017 Attorneys’ Information Bureau. All rights reserved.